Subaru are synonymous with rallying. Even though they haven’t turned a wheel in the world championship since 2009, huge swathes of people associate Subaru with Colin McRae and the boxer engine. Whilst rallying was the means by which Subaru became a household name, in many ways it has become a millstone round the neck of the Japanese car manufacturer. The heritage of the Impreza still dominates everything Subaru do. In many ways, Subaru has needed to re-prove itself; enter the all new Levorg. You may well recognise the Levorg, it’s the current chariot of choice for double Touring Car champion, Colin Turkington. Yes, the tried and trusted method of promotion through motorsport! As a man partial to cars with racing DNA, I was keen to see if this latest offering would match up to the competition. The Levorg is a replacement for the former Legacy estate. I was lucky to get behind the wheel of two different vehicles, courtesy of Desmond Eastwood Motors. 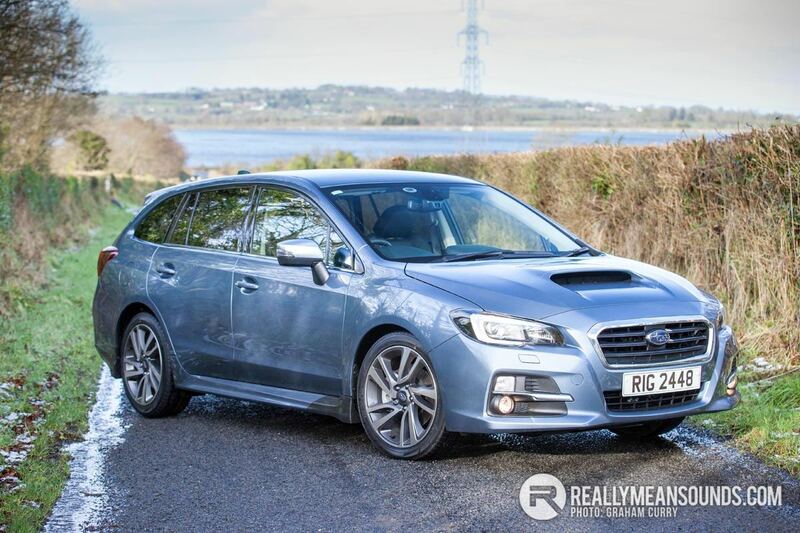 Looks wise, the Levorg ticked all the boxes. It’s a stunning car indeed with chunky arches and the instantly recognisable bonnet scoop, which that is almost a visual trademark of the brand. This was complemented with a large open grill and moulded side skirts running the length of the sill. Sporty dual exit exhausts protrude from the lower rear diffuser, whilst a colour coded roof spoiler provides stylistic balance to the rear end. Opening the large tailgate, I was very impressed by the huge amount of room the boot offers. The split/folding rear seats coupled with a completely flat loading bay make this area very usable. No matter what your background, city slicker or country squire, the Levorg will swallow anything you throw at it – bikes, canoes, small animals and the families of small animals. Inside, the all new Subaru Levorg is a classy place to be. The seats are covered in soft, snug leather and heated too. Accents of blue feature in the stitching for the steering wheel, door cards and dash board. The only let down is the disappointing look of the interior plastics. They are a little utilitarian compared to the rest of the interior finish, but in general the inside of the Levorg is a nice comfortable place to be and has a welcoming appeal. Connectivity is everything in this gadget dominated world and the Subaru excels here. Throughout the cabin, both front and rear there are more USB ports than your average PC. The main port in the lower dash enables drivers to sync phones port with the app radio that comes as standard. This has a 7 inch full colour touch screen and provides BlueTooth, sat nav, access to the reverse camera, as well as Subaru’s starlink service. The main controls and dials are very well laid out and simple to use. On top of the dash, in its own housing, is a multi-function display. This shows all the vital information about the car, including how it is performing, the all important fuel economy stats and the time. When it comes to choosing the right Levorg for you, Subaru have made this very easy. There is only one model, which comes in just three colours with a choice of one engine and a single gearbox available. Yes that’s right, the Levorg only comes and 1.6i GT Lineartronic guise. So, in essence any Levorg you will meet will be a twin-scroll turbo petrol boxer engine mated to an automatic lineartronic gearbox. Power is transferred to the 18 inch wheels via Subaru’s renowned all wheel drive system. The engine doesn’t leap into action with he boxer burble that I expected. Coax the throttle though, it soon makes itself known which is most definitely a good thing. The power plant produces 168bhp and 184lb/ft, propelling the Levorg to 60mph in 8.6 seconds. Acceleration using the lineartronic gearbox is instant and incredibly torquey; however the ‘box itself isn’t as precise as I’d like it to be. The driving experience is aided with Subaru’s Intelligent Drive (SI-Drive) which in the words of Subaru “allows a selection of engine and transmission characteristics according to the drivers driving style, driving expectations and driving situations”. Sport mode made a noticeable impact to the way the car drove, yet didn’t compromise on road refinement. The boxer configuration means that much of the weight sits very low down in the car, helping the centre of gravity and ultimately handling. Throw in the superb grip of the symmetrical all wheel drive system and I can honestly say that the Levorg is probably the best handling estate car I have ever driven; it was simply fantastic and inspiring. Pricing starts at £27,495. Few options are available, although STi lower spoiler is a must have as it gives the car such a purposeful edge. In a crowded segment, the Subaru Levorg sets itself apart from the pack with that serious load space and surefooted chassis dynamics. Really? It looks like a Subaru should, to me. Angular and purposeful. Mind you, Japanese car manufacturers were never famed for aesthetics. | Really? It looks like a Subaru should, to me. Angular and purposeful. Mind you, Japanese car manufacturers were never famed for aesthetics. It has a bit of a muscular look but still a bit "Fordy" to me. I remember seeing this at Geneva. The Mazda estates were much nicer looking, and I thought this was bland in comparison. It looks like an STi which itself looked dated before it was even released, it's an estate and hasn't got a Diesel engine. More chance of seeing a unicorn gallop down the M2 than one of these.